Last season Trails Utah completed its first trail project in the gorgeous Flaming Gorge country of Daggett County. Dowd Mountain, located just 10-miles south of Manila, Utah, is the site of a burgeoning trail system that boasts ponderosa pine forests, abundant wildlife, and stunning views over Flaming Gorge Reservoir. Trails Utah worked with Daggett County, the Ashley National Forest, and members of Northern Utah Mountain Bikers (NUMB) to help expand this trail system, which includes a downhill flow trail. Funding came through a grant from the Utah Office of Outdoor Recreation and Daggett County. Daggett County, tucked away in the very northeast corner of state, is home to a myriad of natural wonders providing days of outdoor recreation and adventure and just over three hours away from Salt Lake City. The Green River, Flaming Gorge Reservoir, and the Uinta Mountains combine to make a truly outstanding playground for hikers, mountain bikers, anglers, and just about anyone who likes to get outside. An extensive trail plan, developed by Joey Klein and the folks at Trail Solutions, features trails along the river gorge, along red rim-rock overlooking the reservoir, and through the rolling pinyon and juniper hills that surround the area. The Dowd Mountain Trail System is one of the first pieces of the trail plan to take shape on the ground. 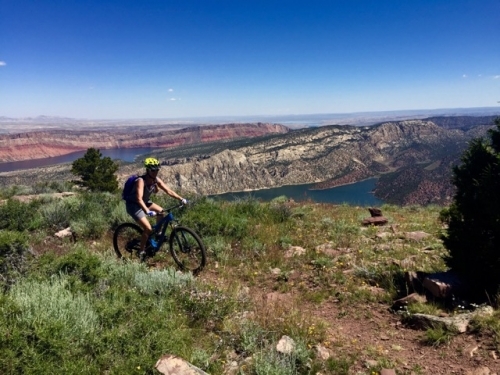 This trail utilizes a number of existing Forest Service roads and some sections of new single track that take riders out to an overlook almost 2,000 feet above Flaming Gorge Reservoir. Enormous views stretch to the north and east into both Wyoming and Colorado. Accommodations can be found in either the county seat of Manila or the hamlet of Dutch John. Choices for camping on Dowd Mountain or surrounding forest lands are many. Trails Utah will continue to work with County planners and Forest Service personnel to build more trail in Daggett County and further establish this area as an outdoor recreation hotspot. Make plans for your visit soon!